One of winter’s best, and cheapest, thrills has to be flying down hills on a sled. My Boston neighborhood hasn’t seen much snow yet this year, but we know it is coming any day now! 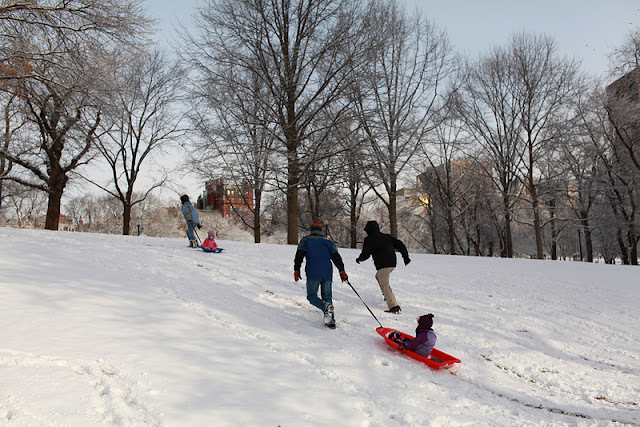 When it does, all the kids will be ready to head out to the Arnold Arboretum for some of the best sledding hills in the area. Before anyone races out the door though, make sure to go over safe sledding strategies with your kids, such as waiting for other people to clear out of the way before taking a turn, avoiding overcrowded areas, and dressing appropriately. Layers are the key. While it may be a freezing walk to the sledding spot, once you’re repeatedly climbing back up hills, it’s easy to get overheated. Many parents like to have their kids, especially younger ones, wear helmets as a wise precaution to avoid head injuries. Along the same lines, kids should never sled where there are lots of obstacles like trees and fences. Don’t forget to pack water---sledding can be thirsty work! In the Boston area, favorite spots for sledding include Arnold Arboretum; the Sugar Bowl next to Jamaica Pond; and Larz Anderson Park in Brookline. Fallon Field in Roslindale is usually packed with people sledding down its big hill that ends in a large field. It’s a wide open space quite safe for younger kids. Millennium Park in West Roxbury is another great open space with plenty of hills to sled down safely. Franklin Park has lot of options for sledding and many people head straight to the public golf course there. Boston Common also has some hills to sled and the Frog Pond ice skating rink can add to a fun day. Popular spots close to Boston include Borderland State Park in North Easton; World’s End in Hingham; and the Crane Estate in Ipswich. While you can swap out your sled for a tube at any of the above spots, there are some great places that take tubing to another level. Try tubing at night for a different experience. Ski Ward in Shrewsbury has eight lanes, with 200 tubes and two lifts. Many people go to Ski Ward for its nine groomed ski trails, but the tubing area is also quite popular. Two-hour tickets let you ride as often as you like down the TubaSlide hill, and since lifts bring you back to the top, you can pack in a lot of rides. Riders must be older than age 6 and at least 42 inches tall. It also has snowmaking equipment on hand, when Mother Nature doesn’t cooperate. 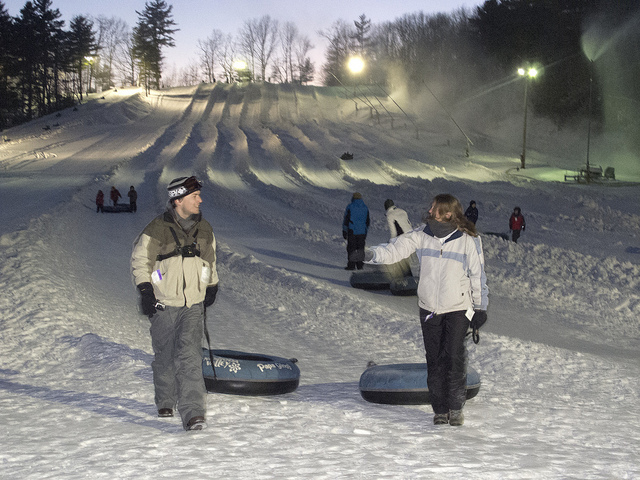 Nashoba Valley’s Snow Tubing Park in Littleton offers 18 lanes and more than 600 snow tubes. Four easy tow-handle lifts take you to the top. Parents who want a break may enjoy the full-service restaurant with views of the action. Timed two-hour tickets let you tube as much as you want. Kids have to be age 6 or 42 inches tall to tube. Get tips on raising the next generation of outdoor enthusiasts in Great Kids, Great Outdoors and find more trip ideas in the Appalachian Mountain Club’s community for families, kids.outdoors.org.